For those special occasions that call for pie or those times when you just crave a slice of pie! Remember this is a dessert, one slice a day! Share with family and friends or take when you are asked to bring a dish or dessert to other occasions. This way you will know there is a dessert you can have, too. Most diabetics can fit this into their diets occasionally. If you can’t, sorry about that! Line a 9-inch pie plate with pastry; brush entire bottom and sides of crust with egg wash. Reserve remaining egg wash. Refrigerate until ready to fill. Drain the cherries; reserve the juice and set cherries aside. In a 2-quart saucepan combine the Splenda, cornstarch, flour, and reserved cherry juice. Cook mixture over medium heat, stirring constantly, until mixture comes to a slow boil. Cook for 1 minute; remove from heat. Add the lemon juice, vanilla extract, almond extract, food coloring – if using, and salt; stir to combine well. Fold in the cherries and pour into the chilled crust. 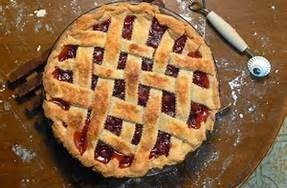 Top pie with a top crust or lattice crust strips, turning edges under and crimping to seal. Brush top crust with remaining egg wash and cut air slits in top if using a solid crust. Use a pie shield or cover edges with a loose foil rim to prevent edge of crust from getting too brown. Bake at 425 degrees for approximately a half hour or until crust is golden and filling is bubbly.